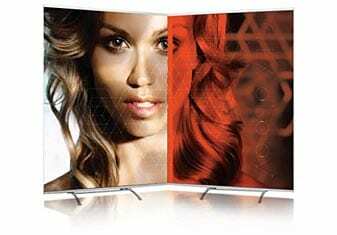 300cm wide displays are made by using two Twinbase XLs to support one very wide graphic. Fabric graphic is not in sections, printed in one piece and therefore totally seamless. This display has a flexible central joint which allows the display to be used straight or angled as you wish. It helps too when folding the display away for transportation and storage. 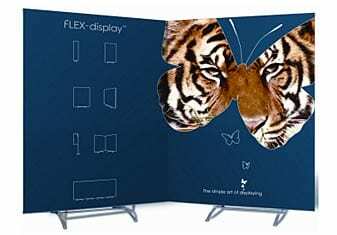 The FLEX-display Backdrop 300 system is very lightweight, especially when compared to a pop-up display for example. Using printed polyester fabric supported by aluminium hardware the 3m x 2m backdrop seen above weighs in at approximately 8kgs including carry cases. The whole system fits neatly into two carry cases measuring 160cm in length by approx 10cm diameter. As we are using 2 x Twinbase XLs with this display, it is easy to use them independently by just having smaller graphics with rails to create to separate banner stands. The stand has been designed with the user in mind and assembly is very simple. See the assembly video below to see how easy it is to put this display together.